On July 27, 2015, there were new allegation of chlorine attack by Syrian government forces, this time in the Damascus suburbs of East Ghouta. Specifically, Jobar, Zamalka, and/or Ain Tarma districts are mentioned. The latter were the alleged epicenter of the 2013 Ghouta Alleged Sarin attack, as was Jobar, at first - see Jobar page here and ACLOS Section on Jobar's rebel CW industry. The poison gas incident that actually happened there (besides any rebels managed in their own basements, none proven) was a couple days later, as the army advance on their facility. Rebels fled, soldiers were left choking, Sarin turned up in their blood, and tools for weaponizing chemicals were found inside. Now the opposition's faith-based "activists" - as always demanding the best real-world evidence - say Sarin-free Assad has attacked the same area again with his new poison of choice, chlorine. This is not the first time since then it's been alleged, but this specifies Jobar, and release during a military assault into the district. Simple precedent suggests cornered rebels are most likely behind it. But simple precedent isn't enough to go on, and they don't seem very cornered, claiming to have soundly won the fight. Amid heavy fighting in Jobar in northeast Damascus, opposition activists claims that the regime has used chlorine gas and retaliated with deadly bombing of another Damascus suburb on Monday. The clashes follow the capture of an important water pumping station by rebels in the area on Saturday, allowing the resumption of supplies to Jobar and nearby opposition-held territory. The failed regime offensive was accompanied by “dozens of artillery shells, rockets, and missiles”. Eldorar reports dozens of civilians being treated at hospital for suffocation from the effects of the chlorine gas. There is no tactical reason to deploy chlorine in this kind of attack. But how could the opposition's cartoon regime fail to couple a failed attack with failed and useless criminality? Pumping station ... not a water treatment plant, specifically. But is it possible the place would do some on the side, or for whatever reason, have some tanks of chlorine on hand, to get shelled, deliberately opened, etc.? No promises with this one, but here's a space just in case, and comment space below for others. - Syrian Network For Human Rights (SNHR - hacks) Tweet: "#Syria #SNHR: 29 victims suffocated from gov poisoned gas missiles on Jober, Ein Tarma, & Zamlka, Jul 27"
- A Tweet by Syrian News has photos - bloodied and smoke-stained people being treated in a clinic. Possibly shelling and not gassing victims. The video runs 16 seconds. We see, in a rebel field clinic, an older man clearing his nose of mucous, a baby girl in distress getting breathing assistance, and a man with oxygen mask. The girl, it will be noted, starts coughing only after making eye contact with the doctor. The noise might obscure a voice command. But it might not - the cough seems genuine to me. - Tweet by Dr. Annie Sparrow (wife of Ken Roth, HRW CEO) "As Security Council drags feet, Assad launches 2nd chlorine attack this week--this time Jobar" Images of the 3 victims seen on the 0:16 video. Links to same video on Facebook by Jobar News. - Qasioun News: "While regime forces shelled with S-S missiles full with chlorine gas over the neighborhood, led to injuries among civilians, as the regime warplanes launched thermobaric bombs while opposition forces defeated it with anti-aircraft where they managed to hit a warplane." - Violations Documentation Center: I gave them a few days, and checked the martyrs database on June 30. All martyrs of toxic and chemical gasses - as of now, it still ends at May 7. This doesn't mean they deny it, but it suggests they aren't in the same loop as the people with the first-hand allegations. Observatory for Human Rights says that 30 people were injured in the recent attack, including women and children. There is no report yet on how many were killed." But did they say that? The SOHR Facebook page says no - back to early on he 26th, Jobar is mentioned 7 times, chlorine zero. Their reports cite regular shelling and deaths on both sides, like here, July 28: "The regime forces shelled places in the neighborhood of Jobar that witnessed violent clashes between the regime forces and allied militiamen against the Islamist factions which led to kill 12 members of the regime forces, including 3 officers." So that was apparently just Arutz Sheva getting the groups confused. How Many Civilians in Jobar? It's suggested the gas attack was meant for rebels, but hit civilian residents mainly instead. I see a leading point of critics on Twitter is the total or near-total lack of civilians remaining in Jobar to be exposed to this gas attack as alleged. It seems a fair point to raise. I would be hazy on the details, but imagine targeted, rebel-held parts should be war zones, basically, and evacuated long ago. But I don't suspect it can be ruled out a random clustering those few left happened to be downwind, or whatever. Such property can be killed on demand, as the army is approaching, some rockets falling, etc. 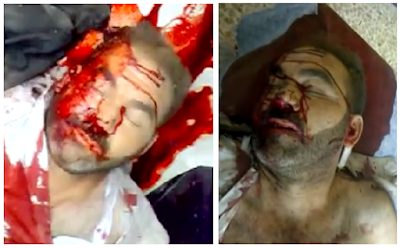 It's easy to document the "regime crime" they fall to - already counted, easily filmed, etc. - adds to the temptation to just do it already. I did an English-language news search again and found nothing further. AP, Reuters, AFP, etc. have all chosen not to do any quick reports, anyway. Didn't feel like trawling Twitter again, but there may be more info coming available there. Space below for anything I find later. 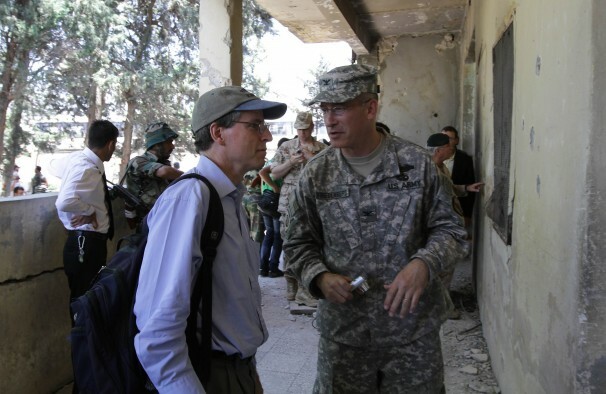 To start, the subject of this post - violence at a certain bridge in the city of Hama - has its clearest glimpse on July 7, 2011, during the provocative visit by U.S. ambassador Robert Ford. He says it was what he saw in these days that convinced there were no armed groups of opposition fighters in Hama, as the Syrian government claimed (see part 2). Throughout this shorter post, I'll refer to this handy list of "martyrs" from Hama province, as recorded by the opposition VDC, for the relevant span - July 4-30, 2011, Hama = 38 martyrs - just before the ambassador's visit to just before the big massacre of July 31 (see part 1). First, the early part - the 4th has Ibrahim Qashoush killed. 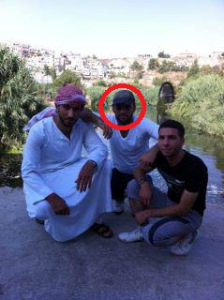 He's the alleged anti-regime singer, more likely an informant, who rebels slaughtered, dumped in the river, and blamed on the regime (see part 3) 2 other men were executed on the 4th, back story totally unclear. Just when ambassador Ford enters Hama is confused - either starting Wednesday the 6th or the next day, ending either Thursday or Friday (total span 1-3 days, with the massive protest he rolled with reported both as on Thursday and on Friday, unclear). 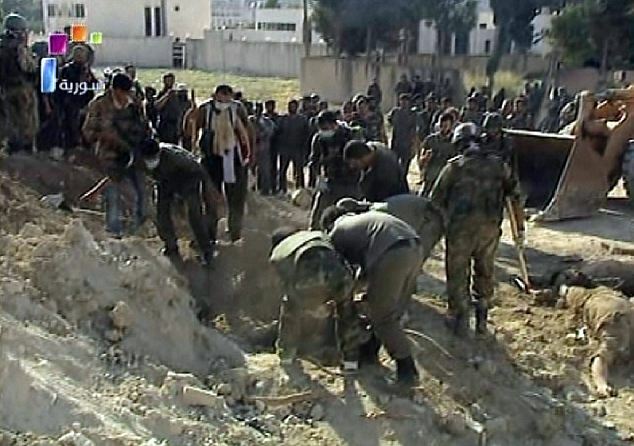 On the 6th, two civilian men died by shooting in Qalat al-Madiq, or Madeq Castle, a crossroads town 42 km NW of Hama. No one in Hama city died. Who was chilling out here, as the "regime" worried the ambassador's visit might spark violence? That was a silly worry - it seems to have calmed things instead. In fact, deaths stay low for a period after as well; after Friday the 8th, just 5 dead before the end of list - on the 9th, 15th, 22nd, and 29th. Death took another break on the 30th before hitting hard with the big bang at month's end, and onward from there. This helps set the context for the oddball exceptions covered below, almost entirely relating to a brief period of brutality at a local bridge on the edge of the city. Thursday, July 7 is the one day we can be sure Ford was in Hama seeing no sign of armed strugle past a slingshot - is - only 3 martyrs on Thursday - 2 civilians and one FSA fighter from Hama Jarajmeh district (west, on the river) - named Kinan Mohammad al-Abdullah, he was shot, not clear where (may not be in Hama). 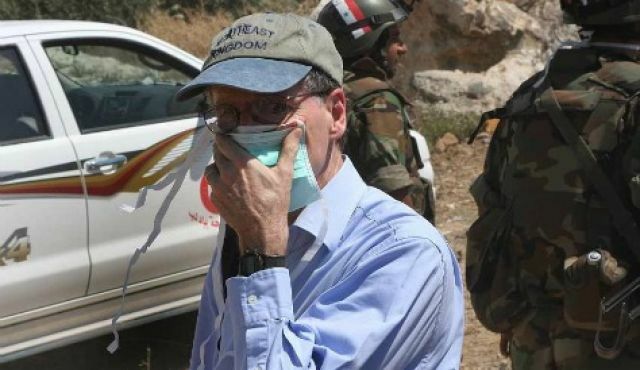 Ambassador Ford insisted there were no armed fighters in Hama at this time, but the city had enough some were dying just then - perhaps elsewhere but maybe in a clash on the other side of town, in which rebels may have briefly taken over an important checkpoint. Consider the two civilians, who both died there, without any takeover noted. 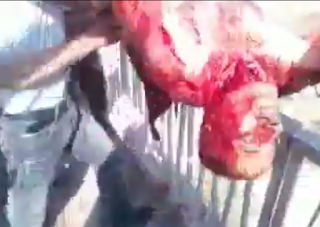 * Mulham Aalwan Civilian Adult - Male Hama Hama 2011-07-07 Field Execution. 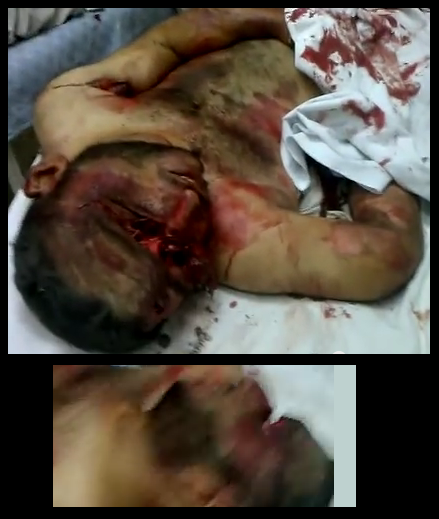 Notes: "He was ran over by heavy machinery by the security forces at Mazarib bridge, which mutilated the body"
* Nourelden Mansour Civilian Adult - Male Hama 2011-07-07 Field Execution. Notes: "the two martyrs, Noor Eddin Mansour and Moulham Elwan, were run over by heavy machinery at Mazareb bridge, an area that is controlled by security forces. This resulted in the significant distortion of the bodies." One victim is severely mutilated, as if run over. His body is damaged mainly at the middle, torn in half, with almost all his guts now hanging outside. Also, his gonads are uncovered. Other injuries, before, during, or after that: he was shot in both ankles, left leg mangled, right arm badly broken, possible stab wound to left shoulder, and a sharp band of trauma across the nose and bloody eyes, possibly the fatal blow (see below). The other man seems dead, bleeding from somewhere on the head, but intact. He has at least one small wound to the left shoulder. We first see them in the back of this white van - not an ambulance, with lights and a siren or markings. Those bodies, especially the mangled one, clearly weren't carried far from where loaders found them. So this is about the spot they were killed. Are these all regime thugs, with this a "leaked" video by them? The van waits several seconds for the important filming, but then pulls away at mid-speed. There's no life to save, but they seem rushed to get out of there.The video ends quickly thereafter. 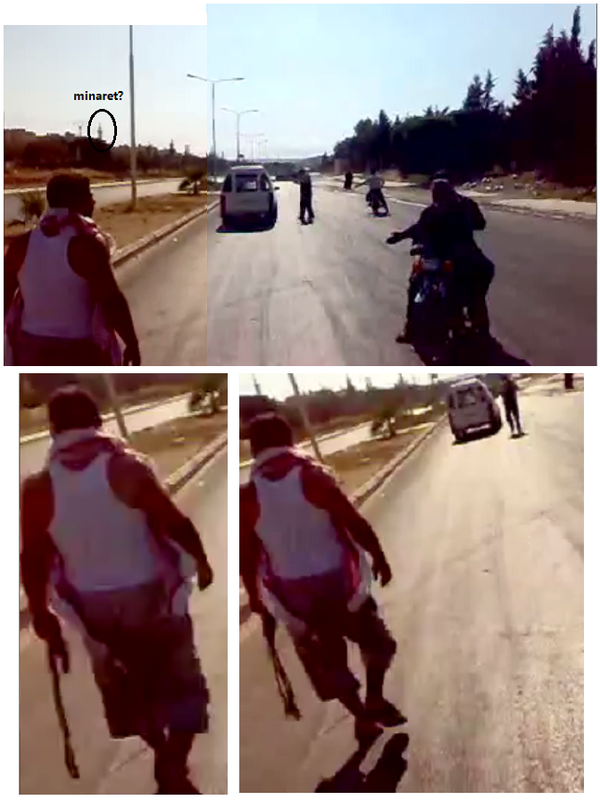 For the rebel story to hold any water, these have to be pro-regime thugs. But the thin crowd present around the scene argues otherwise (See panoramic view below - possible minaret circled for geo-location attempt, further below). We see a few civilian-dress men on motorcycles or standing, and this videographer. 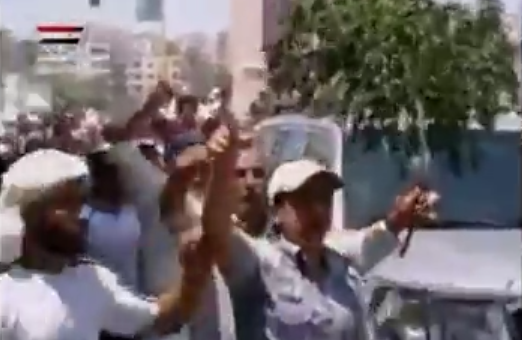 They shout "Allahu Akbar," and something angry about "Bashar." The video was seemingly made and posted by opposition folks (primary source maybe in time, "Crazy Man's" copy works for now). It's a major highway, but empty of regular traffic at mid-day, like there's some disaster or danger on the road (same as it was on the bridge terrorists dump dead cops off of on August 1- see part 1). The marks on the pavement shows some traffic chaos at about this spot, maybe from the same day. The most veering line seems singular, from a motorcycle. How about the man with the fighter's scarf with the stills above? He looks both right and left in the few moments he's visible (with some frames seemingly snipped from the middle). He's on the lookout for someone. What does he do if he sees them? He carries an object with a strap. There's no clear view, but it might be a rifle. Or maybe it's the rebels' single slingshot Ambassador Ford also saw? * dark, indoors: (the other active VDC-linked video) little visual value, but the victims named: the intact one is Mr. Mansour, the torn-up one has a name sounding like something Aalwan. * (extremely graphic) daylight, (video suggestion when viewing the others) in a rebel-seeming morgue, we get to see both victims in better resolution and at leisure, here called unidentified ("faceless") martyrs. (But weren't they "demonstrators" like the guys who picked them up?) Mansour is identifiable as one of the two in the van, by face and hair, and unique blood trickle pattern (with a new line across the bridge of his nose - compared below). for larger view if needed. It's alleged that regime thugs ran these guys over with a tank or some such. Clearly they also did a few other nasty things to them, like some terrorist psychopaths. We know they were "regime" because the place it happened is a place they run - no one else can get there and kill people. But then, implicitly, they decided to leave the area, and allowed apparent rebels come in to film and even retrieve the bodies - if quickly, and on the lookout for the universal "Shabiha's" return. But no way could those same "armed terrorists" have been in control here before or during the horrific murders. Only after, in that window of opportunity rebels so often are granted with such crimes. They make off with the evidence, as usual, with their own vehicles, and take the corpses wherever to document the "regime crime." And they insist they aren't lying when they say this. Or is that a tree and not a minaret? Or is it possibly the minaret I found further SW on that line of sight? (lower left in the graphic above) I think this is more likely - it's not clear, must be kind of distant (if it's a minaret). I wouldn't think that far ... measuring it ... 840 meters? Sounds likely. The purple spot is likely it. There's another kind of antenna tower on almost the same line as the minaret - the spindly thing is not easily found in the satellite images. Anyone else? Possible oval-shaped top part on that. Wherever exactly, I'm pretty sure it must be on this street. With sunlight nearly straight down the street, just a couple degrees west of that - solar azimuth is about 231-233 degrees, so a local time of about 1:40-1:45 PM, for what that's worth. Ahead I think we can see this street dipping down, and then the highway overpass. The bodies are driven into the city, not away from it. On the 8th, as Ford may or may not have participated in the largest-yet Friday protests in Hama, 5 local people died, per the VDC list. One succumbed to wounds sustained on the 5th. One gives no details, just says shot, unclear where. The other three, it says, were on bridges, en route to or from the protest, north of town, or even up in Maarat Numan, Idlib - all 3, in short, not in Hama city. * Isam Fakhri Salmeh Adult - Male Hama 2011-07-08 Shooting. Age 38 Martyrdom location Idleb: Jisr Maara (Maara Brtidge). Notes: on Mouara bridge while he was heading to the city of Hama, accompanied by his wife and children, when military forces fired at him. (my notes: I can't find such a bridge on Wikimapia. It's got a similar name however to the bridge covered above. Is this some kind of goof-up? Or ... The Arabic name here points to the town Maarat al-Numan. It's just over the Hama province border, not so far to be). * Waleed Khalid al-Abbas Adult - Male Hama: Taibet Al-Imam 2011-07-08 Shooting. Age 18 notes: he was martyred after being shot in the abdomen by shabiha. 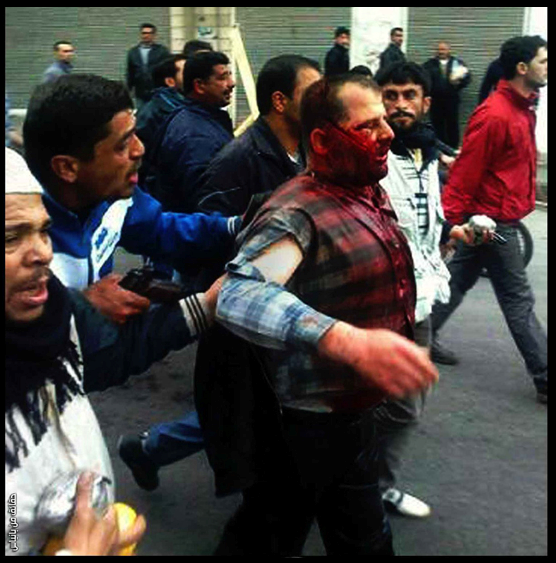 This happened close to Qoumhana, while he was heading back from a protest in Hama. No body video (funeral ones though). My notes: that's just north of Hama city. He wouldn't pull off the highway to cruise near Qomhana, but be killed on the highway near there, while passing (or at a stop there, maybe, if he was on a bus). The others were many kilometers north in Idlib, it says, heading south towards this stretch of road but still far from it. Coincidence, or fudging? All this out-of-town highway traffic involving a bridge stands out in the middle of just this span. Consider - VDC query for Hama martyrs with "bridge" in the notes from March 2011 up to 7 July, 2012 (a year after the main event here) = no one before the July 7 incident, and no more "bridge" note deaths in 2011 after these few on 7/7, 7/8, and 7/9. So, in summary, July 7-9 saw four bridge-related murders, at the government-secured checkpoint - proving whodunnit. But rebels were left in control of, and filming, all 4 bodies right after. After this aberrational period, highway violence let up for a bit, and when it flared up, it was further north. Nothing crazy happens at Mazarb bridge for a long time. I've analyzed a video of August 3 that shows people in a truck allegedly hit by regime snipers, man and woman dead. Filmed from a distance because of snipers, but another video shows activists at the truck. (links later, can't re-locate ATM) Seems to be on the highway just north of the bridge, where it curves more to the west (details maybe later). August 9 - 26 dead around Soran, incl. 5 women, 2 boys, 5 girls . One has notes "Was martyred with her 2 children in shelling their car" - a video shows a pickup truck hit with light and heavy gunfire, off the road and filmed by rebels. They mention Soran and Taibet al-Imam (town). Other stuff also happened, later (details, later). 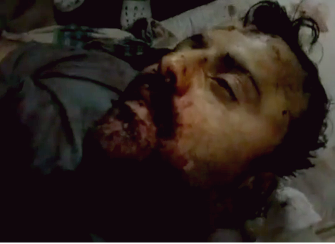 A bit later, this martyr appears: Mohammad Hasan al-Khuder rank: conscript (in Arabic) died 2011-8-23 by field execution. Notes: He was killed by Col. Abdullah Zeer from Homs, because he was sympathetic to the residents and allowed them to pass through the checkpoints. This is likely a fake story, but in context it's compelling. Are these the same kind of "residents" who "hanged an informer last month" (June)," as the late Anthony Shadid heard, and likely did the same to Mr. Qashoush? (see again part 3) Would this guy be in charge of a bridge checkpoint that was both government-controlled and open to letting "residents" pass through, murder nearby, pass back through with the evidence, etc.? Is the time delay a coincidence, or does it line up with an inquiry process to figure out what happened July 7-9 at al-Mazarb bridge? Ibrahim Qashoush is a Syrian rebellion superstar in death - called at the time "the nightingale of the revolution." He allegedly wrote - or famously sang - the original protest song "come on Bashar, leave" in early demonstrations in Hama. But Bashar Assad's thugs allegedly kidnapped and murdered him on the 4th of July, 2011, gruesomely and symbolically; the killers cut out his throat and vocal cords, and dumped him like trash in the Orontes river. The last is the source for the photo above, the less graphic of the two provided. "Residents say security forces shot him, too. But people in Hama dwelled on the detail that stands as a metaphor for the essence of decades of dictatorship: That the simple act of speaking is subversive. “They really cut out his vocal cords!” exclaimed a 30-year-old pharmacist in Hama who gave his name as Wael. “Is there a greater symbol of the power of the word?”"
His death, activists felt, "could mark a new campaign to liquidate protest leaders." (Mroue) But he wasn't a leader or even, as we'll see, the writer or a known singer of that song. And it might surprise the foolish, but his horrific slaying didn't terrorize anyone to stop singing that - in fact, it just boosted the cause; it made the song he clearly died for immensely popular, sung every Friday to defy "the regime" and its clumsy - and highly useful - brutality. As usual, the government of Syria had its own explanation blaming terrorists - bolstered here by the method they're known for. the opposing claims, far from proven or being ruled out, are at least worth considering. The Truth About Syria has what seems the definitive English-language article on this: The Truth about Ibrahim Qashoush, the Alleged Singer and Composer of the so-called “Syrian Revolution” (February, 2012 - hereafter, TAS report) This fairly notes "there are no photos of him alive nor clear photos of him singing. Qashoush is a “media bubble” that surfaced after his death not before, which indicates that the whole thing is fabricated." Indeed, for such a pivotal figure, I didn't see any videos or pictures of him in a protest, singing or otherwise. The Syrian security managed to arrest terrorist “Fadi Zreik”, and what is actually may be surprising for many of you is what he said in his confessions." “Ibraheem Qashoush” was a normal person who was slaughtered by Syrian rebels, because they thought he was an informant who works for the Syrian government." The report lists three other men killed in Syria first called informants and then then martyrs. These are named as Hisham Al-Kharsi, “Mamdouh Al-Akrah,” and “Muhammad Maree.” Each case is accompanied by an explanatory video claiming to show screen grabs of death threats for collaborating with "the regime," and then the victims mourned publicly as, or at least listed and reported as, victims of "the regime." The same is being alleged for this heroic "nightingale of the revolution." Sometimes truth works this conveniently, but ... what a convenient claim by this Fadi Zreik. In this context, the removal vocal cords carries the same symbolic potency. As Anthony Shadid put it, amended: "the simple act of speaking" - the wrong things to the wrong people - "is an act of subversion" - of the plans of the subversives. The throat of last corpse thrown in the river seems to have been slit. Remember Ibrahim Qashush? The man who composed an anti-regime chant? His throat was also slit, and was thrown in the same river, Orontes/al Assi.. In that case, the government had to fish its own dead cops out of the river, and filmed it as just that. But here the activists found their hero first, and quickly; the imagery shows not the slightest sign of decay,water-logging, or bleaching. He was in some water long enough for his hair to get wet. As reported, he disappeared early on July 3rd and was found sometime on the 5th (Al-Arabiya). How were they so certain July 4 was the day he was killed? It almost seems the local "activists" knew when he was killed and where he was dumped, which was convenient when it came to having the body as a dramatic prop for their story. Was the date chosen - by whoever- to heighten the impact of the story with U.S. audiences? Specifically, were they talking about independence to the US ambassador, Robert Ford? 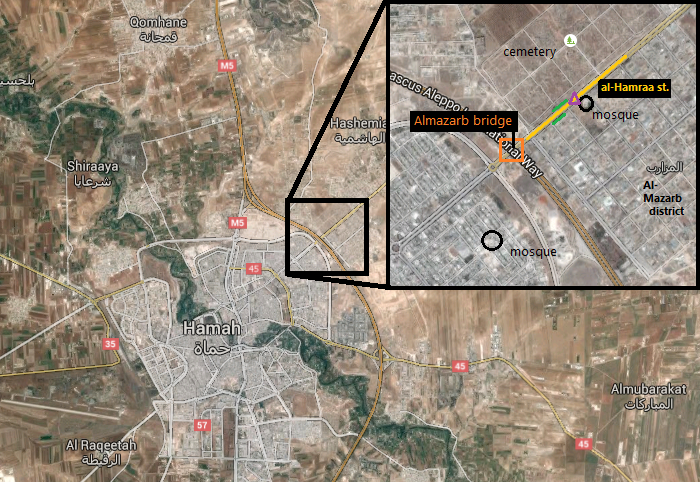 He would visit the city of Hama, controversially, on July 6, the day after Mr. Qashoush's body was pulled up (see part 2). The activists may or may not have known that, but the authorities had apparently cleared it - just not his decision to stay until Friday's protests, as he did to scolding from Damascus. Why would they squeeze in an optional murder of a beloved songwriter just before this visit? That's just what the "activists" alleged. July 8 was the biggest demonstration yet in Hama, half a million they said, chanting “the people want the fall of the regime” and “We will only kneel to God,” and probably singing "Come on Bahsar, leave." And they raged about the death of their nightingale who blessed them with the verses, waved olive branches, and basked in the ambassador's approval as his SUV crawled amongst them. Can we see how well that might have all worked out? Consider also "ambassador" (saboteur ringleader?) Ford then so emphatically denied any armed rebel presence in Hama - at what seems like just the time it was really taking off. Obada and others insisted that the song was actually written by a 23-year-old part-time electrician and student named Abdel-Rahman, also known as Rahmani. Shadid spoke at length with "Rahmani," who seemed to be unworried the throat cutters would ever come after him; "Asked if he was afraid, Rahmani answered, “Of what?”"
The DJ – with the black shirt – has also disappeared for sometime to show up again in Hama. His name is “Ahmad Farhoud”, he is Abdul Rahman’s brother. Ahmad Farhoud was among the terrorists who set up barriers in the city of Hama before the army decided to enter to restore order in the city; Ahmad Farhoud chose to be a “hero terrorist” and he was killed in the clashes. The VDC agrees on this - DJ Farhoud, matching photo included, was killed by shooting it says, in the battle of July 31, 2011, only a week after his brother spoke so fearlessly to NYT's Shadid. That seems pretty quick, at least relative to the July 3 abduction of Mr. Qashouh. Maybe their period of absence was earlier than this PR boost for their theme song. Was it in fact just ending with their return at just about that time? That might be worth digging up. However Ahmad died, his brother apparently lived on, as the TAS report found, getting increasing credit as “Abdul Rahman Farhoud, the real nightingale of the Syrian Revolution”. A TAS comment added later that Farhoud had also become a correspondent and analyst for the Al-Jazeera channel (see 2:47 in this video - April, 2012). But at one time, it was widely believed the nightingale had died, and for that cause - like killing a mockingbird for its freedom-loving song. Or for someone else's song he was even copying. It turns out that was someone else, a mock-nightingale ... Consistent with a made-up story, what was reported about this martyr never was very clear. Shadid wrote for NYT "no one in Hama seems to agree on who wrote the song," although he fairly establishes that as FSA "Rahmani." Mr. Qashoush was perhaps a singer of the song, but that too wasn't certain. Shadid heard the man was "a young cement layer ... from Hadir district. He was relatively unknown before July 4," and after that he was "buried in the city’s Safa cemetery, near the highway." Why kill an unknown laborer? 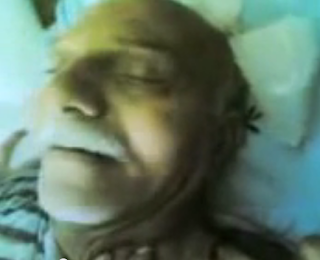 The allegation was he was killed as the most famous incarnation of an anti-regime song. ...rumors have proliferated ... some residents have suggested that Mr. Qashoush was not the real singer, that two men had the same name, that he was really a government informer killed by residents, that he is still alive." “"Every day in the street, just while you’re sitting somewhere, you can hear five or six rumors, and they turn out to be wrong,” said an engineer who gave his name as Adnan. Many here see the government’s hand in everything. Lists of informers have circulated, but some believe security forces compiled them, hoping to discredit protesters or smear the reputations of businessmen helping them. When residents hanged an informer last month, some people in Hama suggested that government agents did it to make them look bad. Note: he didn't buy the suggestion. Shadid heard from one resident "the man killed was a second-rate wedding singer." The Shabab Assafir report (Arabic) adds little, but emphasizes wedding singing, and seemingly better than second-rate. He sang, at weddings, other places, - he could really sing, anything, to anyone. They give no word of other work, implying he was a dedicated professional. Still no images anywhere of that guy actually singing at a protest, a wedding, in the shower, anywhere. "The 42-year-old Qashoush, a father of three boys, was a fireman who wrote poetry in his spare time,said a close friend, Saleh Abu Yaman." Fireman, age 42, father of 3, from a friend - sounds like perhaps the most credible account yet. But this is an effort to salvage the songwiter/singer mythos that totally ignores the information above. The hometown son's star rose with the city. At nearly every protest, the crowds were singing his most popular lyric, "Come on, Bashar, time to leave." It was put to a bouncy tune, and his poems rang with a down-to-earth, jokey "Screw you, Bashar, and screw those who salute you. Come on, Bashar, time to leave!" hundreds of thousands sang behind a singer on stage in Hama's central Assi Square during a rally at the beginning of the month. "Freedom is at our doors. Come on, Bashar, time to leave!" Two days later, on July 3, Qashoush disappeared. Abu Yaman says he was told by witnesses that Qashoush was walking to work in central Hama when a white vehicle stopped, several men jumped out and muscled him into the car. They then sped away. "We immediately knew he was captured by security agents," Abu Yaman told The Associated Press. And yet, this famed hero fireman and protest-inspirer was called by others a "young concrete layer", unknown, and professional singer, well known. But the one source said he was a fire fighter. That might be true anyway, and it intrigued me to re-examine what (now) seems to be an unrelated incident somewhere else and later (I wasn't sure when I started). But just in case it matters here, I may add and link to a post on how apparent rebel/defected soldier terrorists sometimes get their hands on fire fighters to murder and blame on "the regime."